Raised in foster care himself, at eighteen Rob Scheer found himself aged out of the system and living on the streets. His experience inspired him to found Comfort Cases, a charity whose mission is to inspire communities to bring dignity and hope to the nearly 437,500 youth in foster care in the United States. He is the author of A FOREVER FAMILY, a book about his journey to become not only a child welfare activist, but also a happily married father of four adopted children. Scheer shares his tips for adoptive parents. Just think of yourself as a young kid of 12, walking up to the first of what will probably be many homes in what we call our foster care system, carrying everything you own in a trash bag. We cannot take away all the pain they’re feeling, or answer the questions they have: Why did their parents let them down? Why are they not with their biological family? Why do they feel they’re not wanted? But we started our charity, Comfort Cases, because we knew we could do one small thing to make sure that a child on that very first night knows that we care about them, that they matter—we give them backpacks of their very own, filled with pajamas, toiletries, a book, and more. After all, if you were forced to carry everything you own in a trash bag, how would that make you feel? Give your new child his/her OWN personal items. It’s so important as you set up a home for a child in care that you provide some new items to make them feel special. Please do not expect them to use what’s in your home on the first night and assimilate into your family like they have always been there. Consider taking them to pick out their very own pair of new pajamas. Give them their own tube of toothpaste that they don’t have to share with the other people in the home. 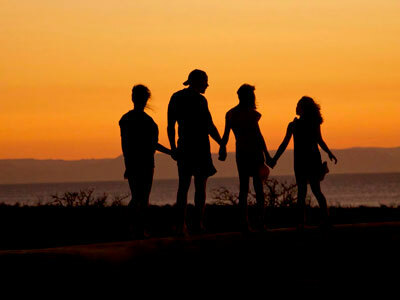 Eventually, when the child feels more secure as part of the family, you’ll all share the family-size tube! For many kids in the foster care system, “routine” might as well be a foreign word. The majority of children in care will enter three homes during their lifecycle in the system, so it can be hard for them to believe that a placement is permanent. This isn’t about harshly enforcing “house rules,” but about helping establish regular, predictable experiences for your kids. If your new child knows that “bedtime” always means a bath, then a story, then snuggling before lights-out, it can become not only a wonderful bonding ritual between you, but also a great way to reassure them that they are safe and loved. Don’t expect a “fresh start” right away. Anyone who decides to take that unbelievable step and become foster parents must understand that these children come with a past. I have met many kids in the system and they often tell me that the moment that they walk into a new foster home, people expect them to forget about where they came from–but that’s just not healthy. New parents need to let them know that it’s OK to be upset, it’s OK to be scared, but it’s also OK to allow us to love them. Understand, the majority of children are put into the system because of choices other people made—it’s my mission to make sure that we change the sometimes daunting statistics about foster care: the fact that only 54% of kids in the system graduate from high school, and 23,000 kids every year age out of care without a permanent connection to a stable family. It’s time that we let them know that the future is theirs and we are going to help them obtain it. As I wrote A Forever Family, I thought a lot about what my kids went through before entering our home and how desperately we just wanted them to know they are wanted. I say this often about my experience: it’s not about the 42,000 cases that Comfort Cases has been able to distribute in 40 states and it’s not about the fact that my family and I had the opportunity to write an amazing book. Most importantly, I want my children to know that as leaders, you do not have the right to sit on the sidelines–get out there and play, get out there and shake it up, but get out there and make a child in care feel they matter. 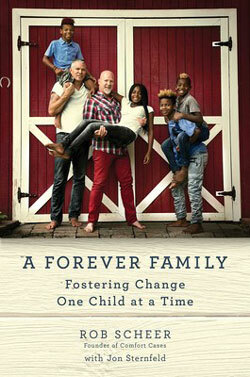 For more on Rob Scheer’s experience helping in the foster care system, pick up A FOREVER FAMILY! You can learn more about Comfort Cases and their #NoMoreTrashBags initiative at their website. Photo by Mike Scheid on Unsplash. In the tradition of The Promise of a Pencil and Kisses from Katie comes an inspirational memoir by the founder of Comfort Cases about his turbulent childhood in the foster care system and the countless obstacles and discrimination he endured in adopting his four children.Rob Scheer never thought that he would be living the life he is now. He’s happily married to his partner and love of his life, he’s the father of four beautiful children, and he’s the founder of an organization that makes life better for thousands of children in the foster care system. But life wasn’t always like this. Growing up in an abusive household before his placement in foster care, Rob had all the odds stacked against him. Kicked out of his foster family’s home within weeks after turning eighteen—with a year left of high school to go—he had to resort to sleeping in his car and in public bathrooms. He suffered from drug addiction and battled with depression, never knowing when his next meal would be or where he would sleep at night. But by true perseverance, he was able to find his own path and achieve his wildest dreams. Poignant, gripping and inspiring, Rob’s story provides a glimpse into what it’s like to grow up in the foster care system, and sheds necessary light on the children who are often treated without dignity. Both a timely call to action and a courageous and candid account of life in the foster care system, A Forever Family ultimately leaves you with one message: one person can make a difference.